A version of this article appears in the July/August 2015 issue of Home Energy Magazine. By now you are probably aware of California’s drought. But other states are experiencing droughts—and where there aren’t droughts, there are probably floods. Water and energy consumption are becoming more and more closely connected, and the situation is not likely to improve. Here are some of the ways our clients experience these connections in their homes. Money. Most people pay for water and sewage together. The average residential water/sewage bill is now higher than the average bill for natural gas. In the near future, water/sewage bills are expected to skyrocket, because so much expensive infrastructure needs to be replaced, and also because there will be less water. Meanwhile, bills for natural gas will fall. For specialists delivering home performance solutions, a home’s water performance will in many regions be more financially important than its heating-and-cooling performance. The price of water plays no role when there’s not enough water to go around. Communities are already rationing water, and homes with wells are running dry. Priorities change. Water supply and sewage treatment systems are capital intensive. In fact, most of a home’s water bill is devoted to paying off these investments. But this creates a community-wide dilemma regarding water conservation: The more people save, the higher the rates, because the cost of providing water doesn’t go down even when people use less of it. Building codes. 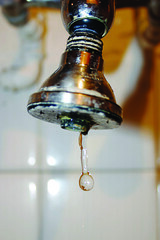 The crisis will spawn a host of new regulations to save water in homes. In many parts of the United States, most water consumption occurs outside the home, so there will be pressure to require low-water gardens and efficient irrigation systems. But we need only look at Australia to see the future. There, building codes require rainwater catchment and graywater systems. Expect to see the ancient word cistern enter the lexicon of modern home performance. Energy. The energy-water nexus is a hot topic, but what does it look like in practice? First, it will become more important to choose water-efficient appliances. Water efficiency translates into energy savings when hot water is involved—think of clothes washers, dishwashers, showerheads, pool covers—and the energy savings are financially more significant than the water savings. The 10% of U.S. homes with well pumps save energy wherever water is saved. Many homes with well pumps are being forced to drill deeper to ensure a reliable water supply. That translates into more pumping energy per gallon supplied. Water scarcity spurs vigilance. Nowadays, that vigilance is accomplished with sensors and controls, most of which are powered by electricity. The first target is the garden. Recently an Australian visitor showed me a smartphone app that allows him to microirrigate his garden depending on today’s weather and soil conditions. Other kinds of leak detection devices and alarms will soon come on the market. Human sensors and controls also work in some households. Ultimately, water use is dictated by behavior, probably more so than energy use. The slogan “Yellow is mellow, but brown goes down” can substitute for a water-efficient toilet. When showering habits change from recreational to hygienic, water consumption plummets. Cisterns and water-recycling systems have their own unique energy requirements. A cistern now on the market uses a 40W ultraviolet light operating constantly to ensure sanitary water. That’s about one refrigerator’s worth of electricity. Pumps and other controls could further increase the energy consumption of water-recycling systems. This may still be a small price to pay for clean water. It’s surprising how many droughts occur next to the sea. Sadly, there’s a huge difference between salt water and sweet water, and converting the one to the other is expensive, in terms of both energy and capital. Desalination only makes sense in extremis and for carefully controlled indoor uses. Don’t expect the oceans to be our source of fresh water, or at least not soon. Water conservation must enter the home performance industry’s repertoire of technologies and services. It will certainly begin in the drought-stricken regions, but the logic of water conservation applies everywhere.